Jodi Beder, cellist, was thrilled to join A Musical Heart in 2018. She has performed with numerous classical ensembles including Princeton Symphony, Palm Beach Opera, and Chamber Orchestra of Philadelphia, and plays Baroque cello with Nina Falk in Arcovoce. She has always been a committed performer of newly composed works, and for years was a soloist in the American Festival of Microtonal Music in NYC. She was a core member of the Dovetail Ensemble, a cross-cultural musical collaboration based in DC, and her famous painted cello Zizi is well known to fans of the cabaret-rock ensemble Zen for Primates. 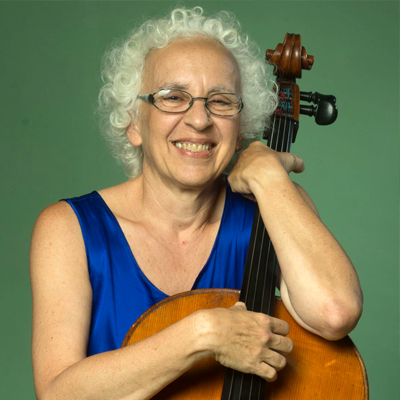 The solo cellist for a synagogue in NYC for over 30 years, she also works in the klezmer tradition of music. An improviser, she has often worked with poets and dancers. As a composer, she has frequently collaborated on theater projects with DC playwright Caleen Jennings. Together they have performed Jennings’s “Hands Up,” originally written for Forum Theatre’s (Re)Acts, at the Kennedy Center and at numerous forums to promote discussion of race and violence. She earned her BA in music from Brooklyn College, attended the Mannes College Professional Studies program, and earned her PhD in music theory from CUNY. Jodi copyedits music, poetry, science, and other books for W.W. Norton and Princeton University Press, and is a Master Gardener.